Based on recent developments, I’d have Thompson 4th behind Guhle. Also there have been recent articles that Oglevie could challenge for a roster spot. Based on that info I’d have to move him from 22nd to 14th ahead of Hickey. Inkman, I’m not sure about comparisons to Olofsson. The closest one for me is Arvidsson. The 5’9 forward put up 16g and 40 pts at 20 in his last season in the SHL. He burned the AHL up at 21 for 55 pts before jumping into the NHL at 22. William Karlsson might also be a comparison as he also came over at 21 and he didn’t fully blossom until 25. Hornqvist also a 7th rd pick also came over at 21. Hoss, you don’t think Olofsson is one of our better prospects? 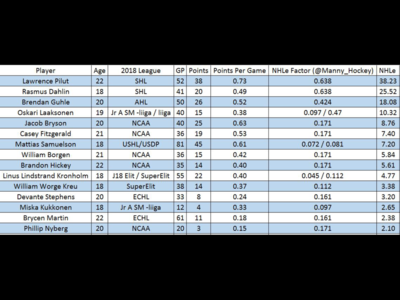 I do, I just realized when I edited the list to get Thompson in there (I based it off your list so I forgot him) I didn’t put Olofsson back in. I’d put him at 6 right behind Thompson. I don't have Samuelsson in the top 10 prospects. He's like 12 or 13th in my mind. Why do you guys have Nylander in the top 10? Because he’s still a top talent with a real chance at becoming an NHL player. I know anything that takes more than two years is unacceptable but there’s legitimately no reason to give up on him. He likely won’t have a ton of value in a trade, so you have to hope he puts it together. There are players who have been bad in the AHL but taken off once they got to the NHL. Different levels of competition have different impacts for certain guys. First off, I have to ensure we’re on the same page with regards to NHLe, or NHL equivalency. It’s a simple, but effective metric for gauging how impressive performance is in feeder leagues for NHL players. It was created by Gabriel Desjardins and you can read about it in greater detail here. At its core is this: If a league is more difficult, then the more points a player scores in that league is more impressive than a player scoring a similar number of points in a less competitive league. If you play in a C league and score a ton, your friends will be impressed; if you go slum it on Novice league night and score all the time, no one is impressed. Additionally, there have been studies done regarding how well a player’s NHLe correlates to the points they score once they do make the jump. While imperfect, it’s useful. I asked Emmanuel Perry, creator of Corsica, to answer a few questions about the updated version of NHLe he released on Twitter the other day. First, what is NHLe and how can it properly be used? How has it changed since Gabriel Desjardins created it? Are you doing a straight points-per-game equivalency? Or are you accounting for TOI or any other factors? I noticed you listed NCAA as having a NHLe of 0.17. Previously, I’ve seen separate equivalency ratings for the different conferences in college hockey. Why did you opt against that? How can you best use your NHLe on players that jump from one league to the next, before getting to the NHL? Most fans know you as the creator of the advanced stats site, Corsica, but I believe this is your first public foray into draft and prospect work, yes? What interests you about it and what else do you have planned? I do like how Oskari Laaksonen is up there as well. I wonder if he is in Rochester for the 2019-2020 Season? There’s been some positive vibes about him throughout the year. 12 point projection for Mittelstadt. Sweet model. Its weaknesses are fully outlined in the post, and there are more, but Mittelstadt's production certainly wasn't anything to write home about (for perfectly explainable reasons) and that's all the model uses. 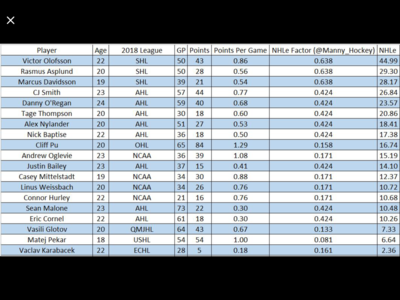 But for someone looking at a chart like this, and being less familiar with the players, like say if I personally was looking at a list of other team's prospects...Mittelstadt's projection being so obviously terrible would fly over the heads of many people, or at least the stats of lesser known prospects would, should they also be similarly off. The thing about this particular one, is that it does provide you with consolidated data to answer a question that, without a doubt, gets asked. If you're looking at UFAs from Europe, in several different leagues, you'd want to know how players coming from that league have fared over here in the past. you'd much rather have had someone do the legwork and figure it out based on literally every example of a player coming over (midseason in this analysis) and average it out (and have the deviation stats handy as well) than just you, yourself, the internet, and ten websites for ten leagues, tabs open for every season, fruitlessly scanning yourself. I don't think anyone is putting their mortgage on this one, but it's much better that the model is there than if it wasn't. It's information readily available versus painstaking analysis away. When I pointed out that the difference in post-draft performance between Casey and Alex Nylander - 7 months apart in age - was not what people perceived it to be, this is exactly what I was talking about. He has progressed quite nicely in his post draft year. Was his military obligation in Finland the reason he wasn’t at development camp, I remember Risto missing a few camps for the same reason. 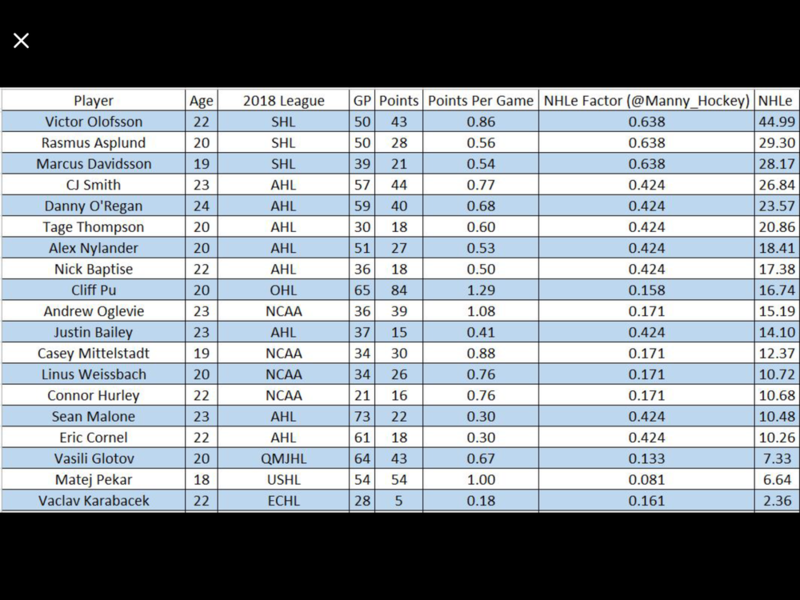 And another argument for why these numbers always have to be taken with a grain of salt: Every farmer and their mom knows Mittelstadt is on another level to Nylander. Perhaps several levels, regardless of the fact his NHLe is 6 points lower than Alex's next season. We'll see what Botterill thinks. In-depth writeups on our top prospects. Nylander is an underager playing in a pro league. Some players are able to transition quickly without problem. Nylander had a year of being bullied by Cal O'Reilly from all reports and started last year with an injury that kept him out for quite a bit. He turned 20 in March. Considering I don't expect first round picks to be NHL ready for 1-3 years post draft (Dahlin's of the world excluded), it doesn't really bother me that a 19 year wasn't NHL ready. This is a big year for him but he is still a top 10 prospect for the Sabres. Think of it this way. Do you have a more favorable impression of Cliff Pu or Alex Nylander? Is your impression of Pu impacted by him putting up 86 and 84 points in his 2 post draft years? Are you willing to give up on Pu because he hasn't made an impact in the AHL yet at only 20? Nylander could have played Juniors or overseas that last 2 years and it would have helped him and his reputation among fans. I am more than willing to give him this year to see if he is worth it. Think of it this way. Tage Thompson is more physically mature than Nylander. Most people have a positive view or at worst neutral view of Tage. He produced .6ppg in the AHL last year. Nylander who is 4 months younger, produced .53ppg in the AHL. Now we can argue about this comparison since both had 8 goals but the point is, Nylander should have gone back to Juniors or Europe at 18 and then should have been re-evaluated. Instead Tim Murray f####d up his development and his head and then under the new regime he got injured before he could get going. Will he actually pan out? I don't know. I haven't seen that compete level that needs to be there for me to believe he will but his skill is undeniable. Again, we shall see. LGR I couldn’t agree with you more. Nylander’s “problem” stems partly from his performance and partly from the perception that he should have never been he pick. 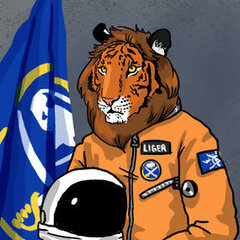 He also suffers from comparisons to Mittelstud. I agree he should have gone back to juniors or Europe, but I also don’t think that is all on TM. I could be wrong, but I thought his dad also wanted him in the AHL. You wonder how much better guys like Grigorenko and Girgensons would be if they had been handled and coached properly. I completely disagree with your guys' takes of people's problem with Nylander. His numbers by themselves are underwhelming, but we fully understand that he should have gone back to juniors and was set back because of it. None of those comparables have had a single work-ethic issue raised, where it's been talked about by coaches for the last two years with Alex, and observed by fans who payed to watch him dozens and dozens of times more than we ever have. And it hasn't been fixed - he was healthy scratched for his team's playoff games because of it the most recent hockey sample size we have for him. If you don't have the most important aspect for getting from his level to the next level, and the skill/base stats underneath it are as trash as Nylander's are, why should any fan have any faith? Why not have more faith in Cliff Pu, who is known for being a non-stop high-energy motor on the ice who will MAKE the coaches play him with his play? It really isn't about the numbers at all with Alex, other than the numbers don't SAVE him from a flaw that he hasn't come close to overcoming yet. Not all 19yr old kids are driven. I also noted in my response his work ethic. Further I can name a dozen players that were hard workers and nothing more at the NHL level. Great, you worked hard but still can't produce, fantastic. You need both, the question is will Nylander's mental maturity grow so he does have that compete. No idea but I am not throwing him out after 2 mediocre seasons.